Dinner cruises to some of the many wonderful restaurants along the Intracoastal Waterway and downtown bay front historic St. Augustine, FL are a wonderful way to see this awesome coastal city---by boat of course! Don’t forget sightseeing the Intracoastal Waterway to some of the many nature preserves and estuaries such as Guana State Park, Washington Oaks State Park, Fort Mantanzas, and the beautiful Tolamato River basin. Special occasions on the historic St. Augustine bay front include Fourth of July fireworks, Nights of Lights during Christmas and Blessing of the Fleet. Other Services are available including Burial’s at Sea & Weddings;-). Weddings performed by The Captain are only good for the duration of the trip! Call for details. Our crews have years of experience fishing in these waters---only the most experienced in sport fishing. Capt. Brian Sasaki-Scanlon, Jodie Lynn I Saltwater fishing, deep-sea fishing, big game fishing, shark fishing, sail fishing, east-edge fishing for Yellow fin Tuna -- full of non-stop action. Jodie Lynn Charters is Florida’s deep-sea fishing at its finest! Friendly, fun, Professional – We ARE your fishing headquarters! Come to beautiful historic St. Augustine and experience lots of action sport fishing. Situated on the beautiful Atlantic Ocean between Jacksonville and Daytona Bch, FL this beautiful city has some of the best blue water sport fishing available. When you charter with Jodie Lynn Charters we offer inshore and offshore deep sea fishing trips for a minimum of 4 hours. We offer longer charters enabling you to enjoy the luxury of catching many varieties of fish in larger quantities. Blue water, gulf stream fishing offers Blue Marlin, Mahi-Mahi, Black fin Tuna, Yellow fin Tuna & Wahoo just to name a few! 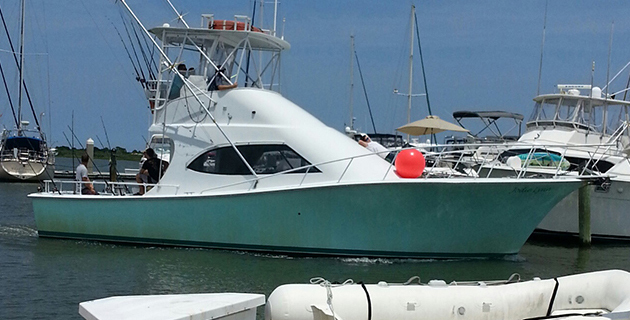 Jodie Lynn Charters invites you to join us for a fishing charter experience like none other. Contact us. Consider this an All-inclusive sport fishing charter! Please see package trips that include everything. Hooked up is what you will be when you come fishing with Jodie Lynn Charters. We are located right off A1A in beautiful, historic St. Augustine, FL on Anastasia Island. Call for the best in Sport Fishing---Jodie Lynn Sportfishing Charters---Northeast FL---St. Augustine---Anastasia Island---A1A.